Polish Independence day is always celebrated on November 11th each year and celebrates their independence from Prussia, Austria and Russia. People celebrate this day by attending parades, fireworks, dances, carnivals, and military displays with much patriotism and pride about their countries independence. This independence day holiday is a national holiday with most business and government offices closed. Over one hundred years Poland was split up between Prussia, Austria and Russia. 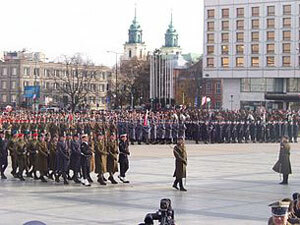 At the end of World War 1 November 11, 1918 Poland was granted its independence. This holiday was abolished when Poland was under Soviet Union communist control and later re-instated in 1989.